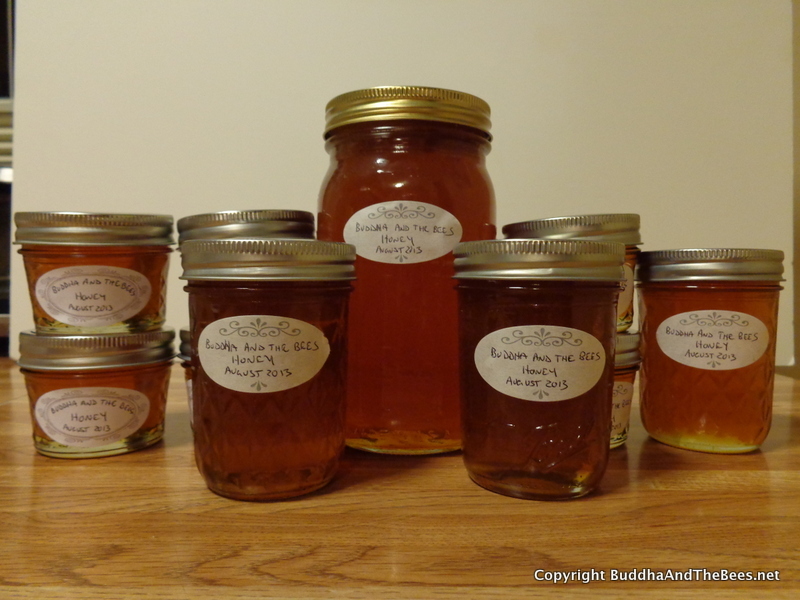 As 2013 closes out, I was thinking about my first year of beekeeping – the good, the bad and the ugly. It’s been an exciting year and, as of this writing, my bees are still alive. How well they are doing remains to be seen. Getting ready. Preparing to get bees was the most fun I’ve had in years. I spent hours planning out the bee yard – designing and redesigning the fencing over and over and laying out where the plants would go. 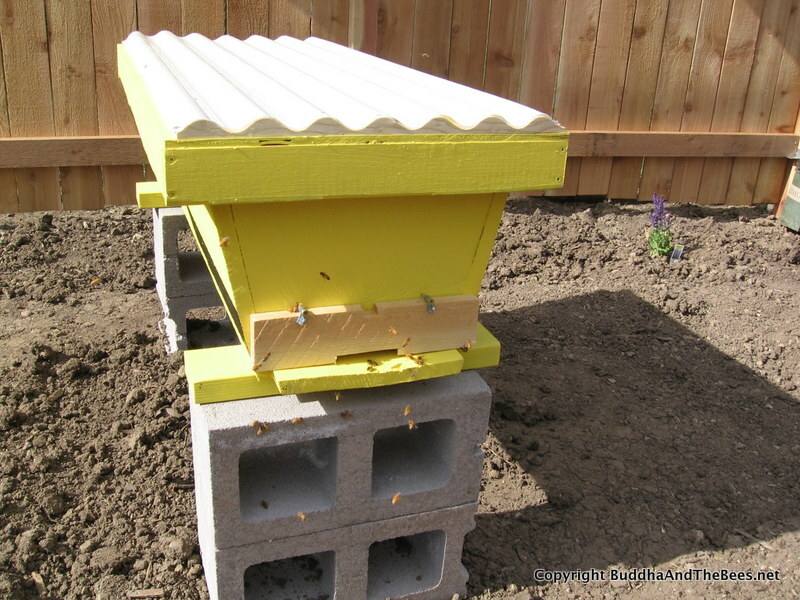 The bees were ordered and due to arrive April 27th, but, by the beginning of April, the garden area was still a mess and I had yet to build the hive. We had a bunch of snow in April which slowed the outdoor work. I attended a package installation at Delaney Farms in Denver before I got my bees which was very cool! I finally got the hive finished the day before the package arrived. The installation went smoothly – thank god for all the YouTube videos I watched on package installations! Managing the hive. 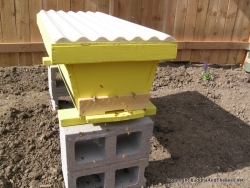 I finished the arbors for the bee yard after the hive was settled and continued to add plants to the bee yard. The bees quickly built out their combs and the queen seemed pretty productive. A beekeeper who keeps a hive in our neighborhood stopped by when I was doing a hive inspection and said the bees were doing really well – a much appreciated confidence boost. During summer, I did weekly inspections, usually enlisting my son Patrick, but sometimes Diana to help. Some inspections were great, some not so (see below). 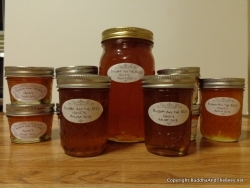 We had our first real honey harvest in August and another in September. All told, we got about 2 1/2 gallons of honey which I was told was pretty good for the first year. Going into winter, we left 15 bars – a few more than the 12 that Les Crowder recommends – just to be on the safe side. Making connections. I met some wonderful people through the Boulder County Beekeepers Assosciation (BCBA). I attended most of the meetings – even skipping out on Diana’s yoga class to do that. Most were willing to listen to my worries and tell me that they’d been through those troubles themselves and what to do to make things better. I took my 6 year old neighbor with me to be on the BCBA float in the Boulder County Parade which was fun for both of us. Stings. I had never been stung by a honey bee before this year and was nervous to find out whether I was allergic to them or not. Miles Mcgaughey – president of the BCBA – told me to catch a bee by putting tape around my finger sticky side out, put that on a bee’s back to catch her and put her to my arm and let her sting me. I decided to take the plunge in May and boy did that hurt, but I didn’t go into anaphylactic shock! However, after that, I got more stings on my hive inspections and one time my arm swelled up and was painful for a week. That bee stung me through my suit! I got a prescription for a couple of epi-pens to keep on hand – just in case. Year end count was about 8 or 9 stings. Mites. I have a screened bottom on my hive and made mite checks every few weeks. There were hardly any mites found on these inspections which kept me hopeful that things were going well. On the last inspection in September before the cold weather set in, I did one last mite check and found about 20-30 mites on the board. It was too cold to open up the hive and I was going to China in October, so couldn’t really do anything about the mites this year. I’m hoping they survive the winter and I can start some integrated pest management (IPM) next spring. I hate those little mites! The Flood. In September, Northern Colorado experienced one of the worst floods it has ever seen. 9 people died, thousands of buildings were destroyed, roads were washed out and many people were displaced. 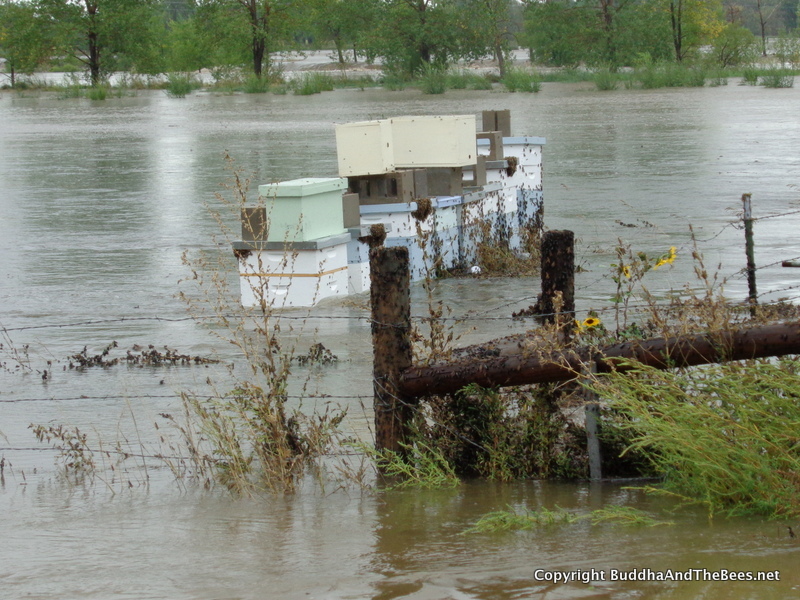 Fortunately, we live at the top of a hill, but a few blocks away, many homes (and beehives) were flooded. Several beekeepers lost bees and hives. Miles wrote an article for Bee Culture magazine about the flood (he lost 90 hives) and used a picture I took of some flooded hives in our neighborhood. During the week of rain, my bees were confined to their hive and when they finally emerged, I noticed staining on the front of the hive which looked like what happens when a hive has a nosema problem. I haven’t had my bees tested, but they don’t seem to be having other symptoms of nosema. Worry. I spend more time worrying about my bees than I probably should. When they bearded on the outside of the hive most of the summer, I worried that there wasn’t enough ventilation and my hive design was bad. If I couldn’t find the queen, she must be dead. There were stains on the hive front – must be nosema. When I broke combs, I killed bees. I always tell Diana that if I knew what I was doing, I’d be dangerous. But, here they are, still alive, so maybe I should just relax a bit more. Comb Collapse. Up through the end of June, I felt like this whole beekeeping thing was a piece of cake. The bees were thriving and I was feeling good. Then I left them alone for a couple of weeks and they ended up cross combing a couple of bars. It was a hot day and when I went to move the combs, they collapsed into a big mess. I had not idea what to do – should I leave it there or take it out? Honey was oozing all over the place and my gloves were coated with it. I tried to use hair clips to tie the comb back on the bar, but the comb kept falling apart. To top it off, my smoker went out and the bees were pretty agitated. I finally put the comb at the back of the hive and closed it up, but spent the rest of the afternoon (what else?) worrying. I decided to go back into the hive before evening and take out the big chunks of comb that I could. I crushed the comb and got some honey, but was pretty distraught. I was ready to throw in the towel. At the next BCBA meeting, I related this story to a couple of beekeepers who told me not to worry and gave me some advice. Miles said, “I hope you got some honey out of it!” After that, I relaxed and started working the hive earlier in the day when it was cooler. So, as 2013 comes to a close, I have the overall feeling that it was a good start to my first year of beekeeping. I tell everyone that I fully expect my bees not to make it through the winter, but perhaps that’s just me trying to lessen the blow if it does happen. Time will tell. I’m looking forward to 2014. I’m going to add another hive and help my neighbors set up a chicken coop. I’ll be planting more bee friendly plants and advocating to my neighbors to not use pesticides. Last year, we had late snow and cold that wiped out the fruit blossoms. I’m hoping this year will be better and the bees will get to enjoy the apple blossoms. And, as this is my first blog post, it marks a new beginning. We will be slowly filling out the website and posting more in the new year. Just want to let you know how much I am enjoying reading about the trials and tribulations of beekeeping! Keep it up – I’m looking forward to future posts! Happy New Year to you and yours. Thanks for the support, Paula. Happy New Year to you also!